about 400 feet from Happy Valley Road. 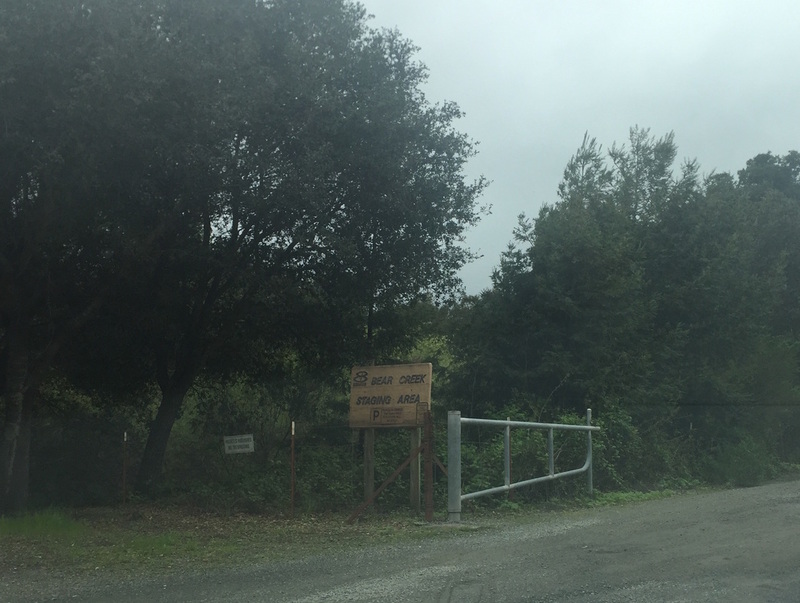 There is another Bear Creek Staging Area a 1/3 mile down on Briones Valley Rd. 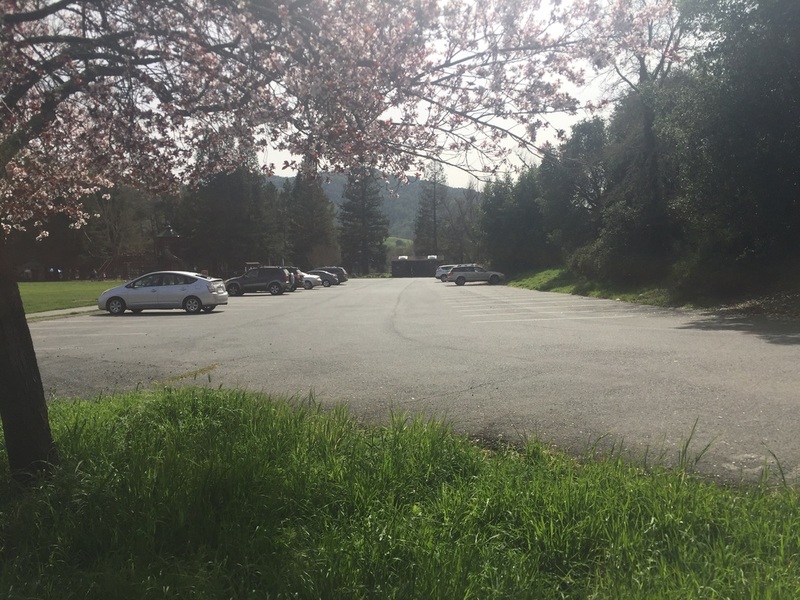 Parking: Free parking lots at Rancho Laguna Park, Valle Vista Staging Area and EBMUD Bear Creek Staging Area. 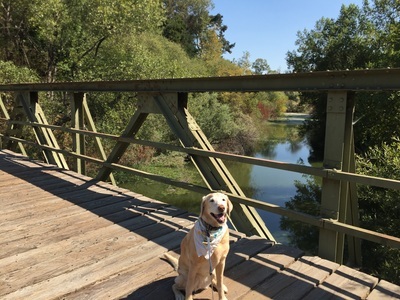 Regulations: Dogs allowed on-leash (with permit) on the following trails: Oursan Trail, Hampton Trail, Riche Trail, and Kings Canyon Loop. Swimming is not allowed. Best time to visit: Anytime if it's not a hot day, as most trails are fully exposed to sunlight. 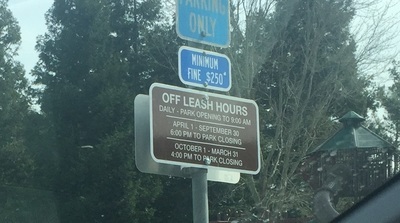 Permits: Permits cost $3.00/day, $10.00/1 year, $20.00/3 years, $30.00/5 years. 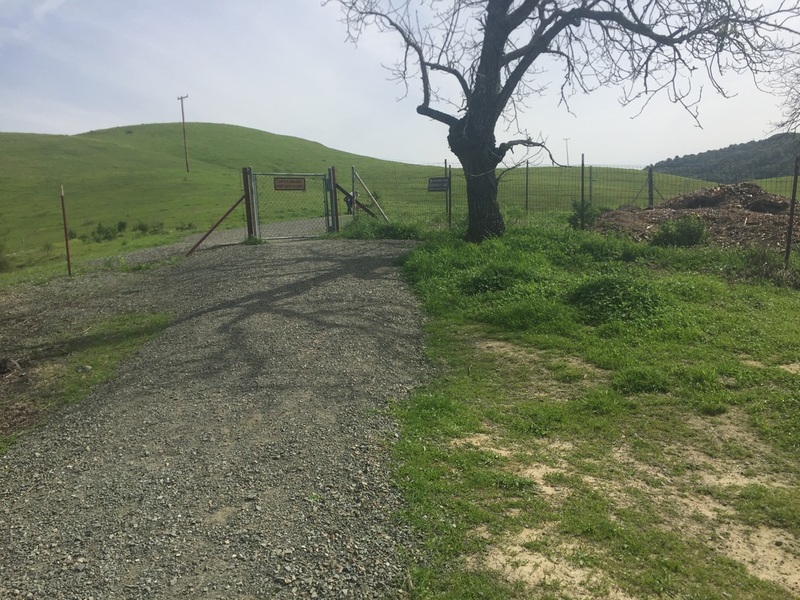 Trail permit holders can bring family members and 3 guests for free. 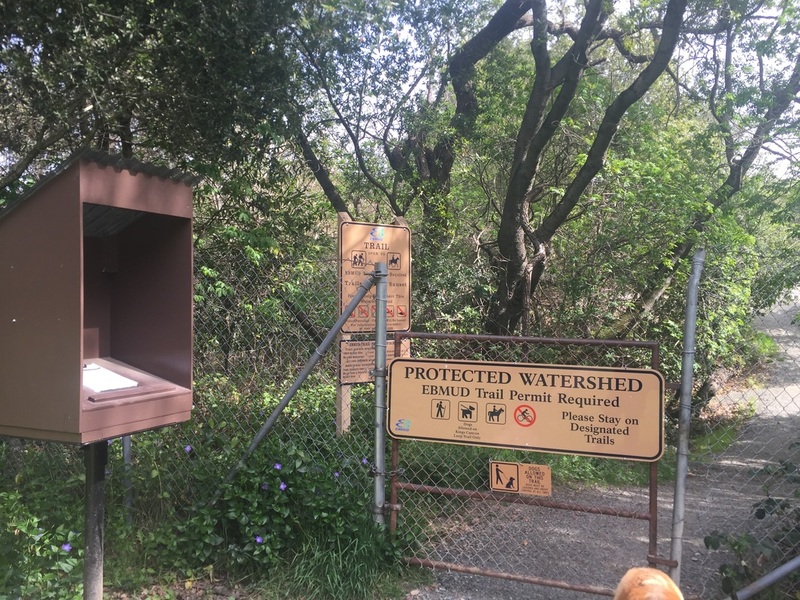 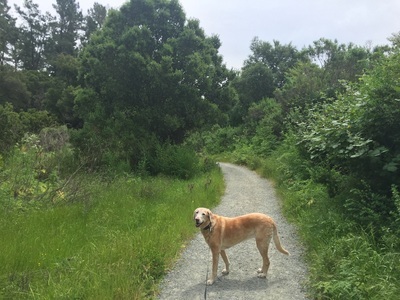 Description: While a permit is required (currently $10/year), the cost is well worth it for a hike in these beautiful, secluded trails above Redwood Regional and Tilden Park, a few of which are dog-friendly. This hike affords great views of the Upper San Leandro Reservoir and the Briones Reservoir from the Moraga or Lafayette trailheads. It's possible that you won't see another person or pup during this hike, as these trails are little known. 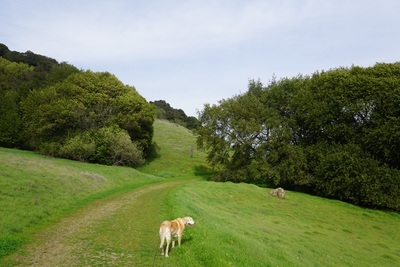 During your trek, you'll hike through green fields lined with wildflowers. 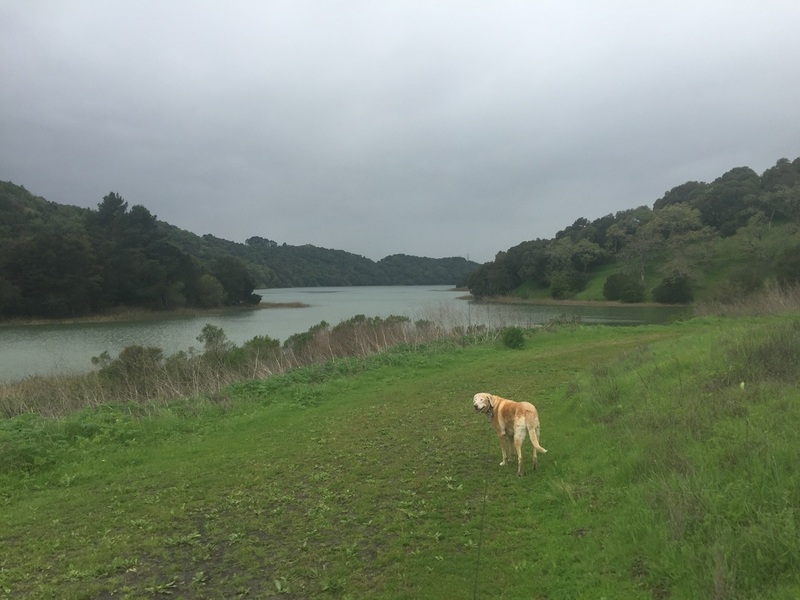 At the creek, you'll find newts; at the reservoir, you'll hear ducks and see egrets and herons. 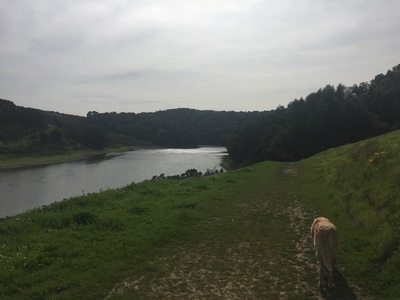 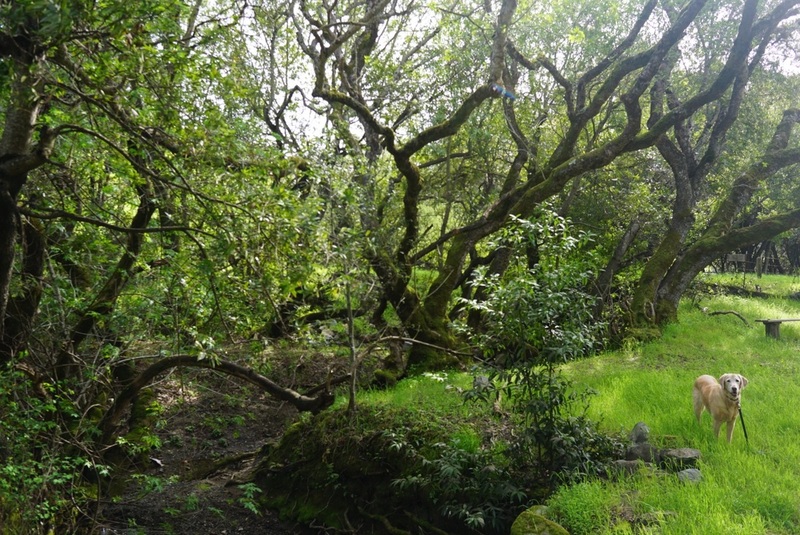 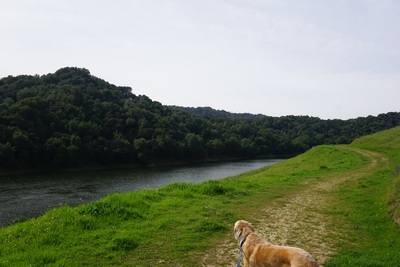 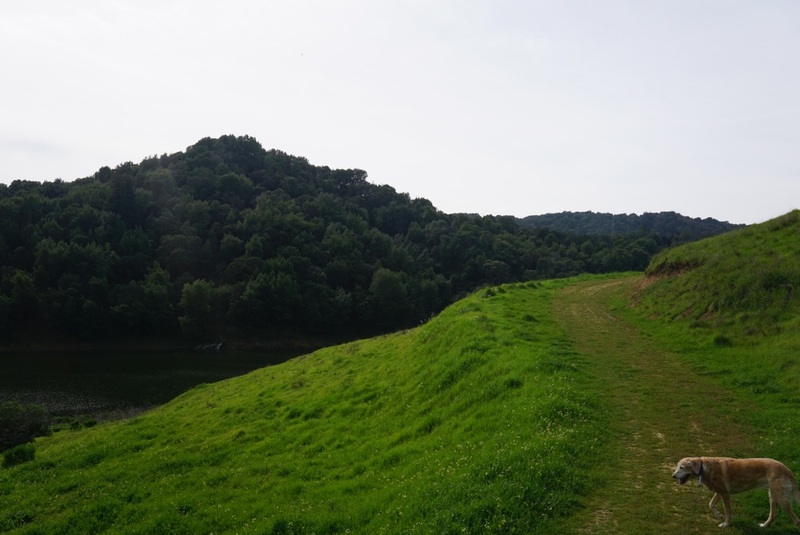 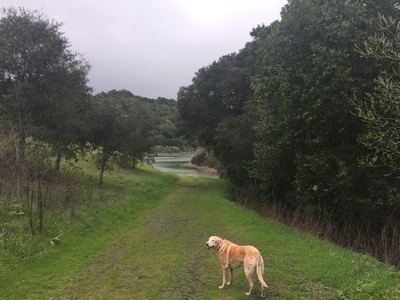 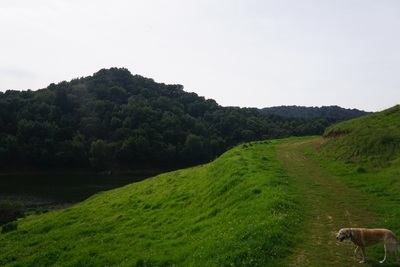 These trails are reminiscent of the upper trails of Lake Chabot in Anthony Chabot Regional Park, or the Rim Trail in Lafayette Reservoir, except they are greener and more peaceful. 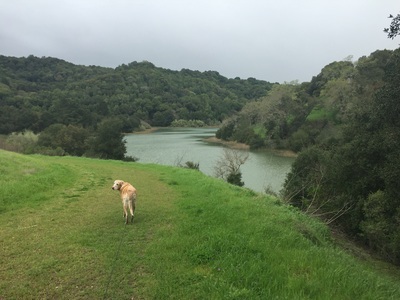 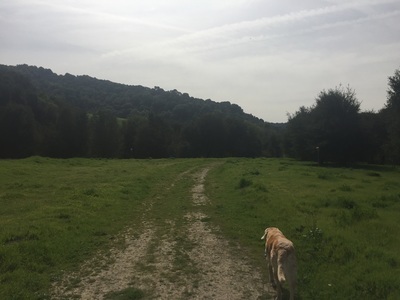 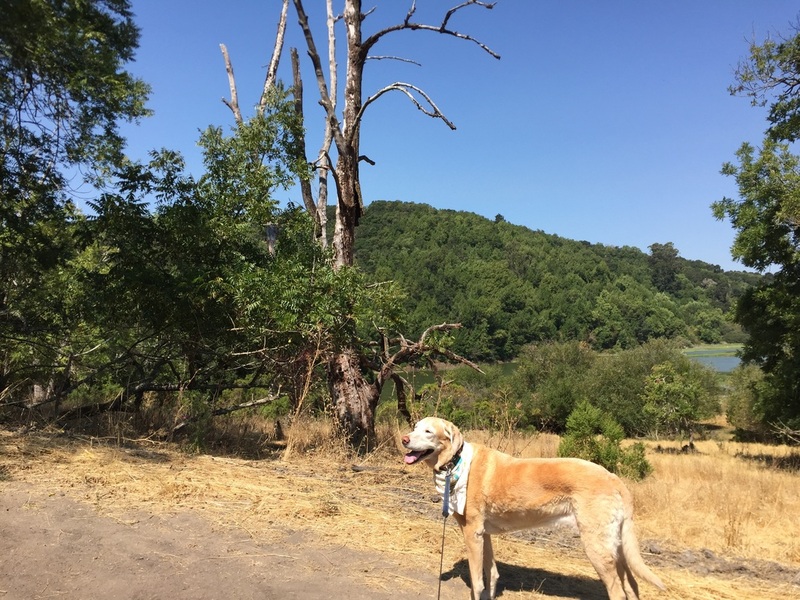 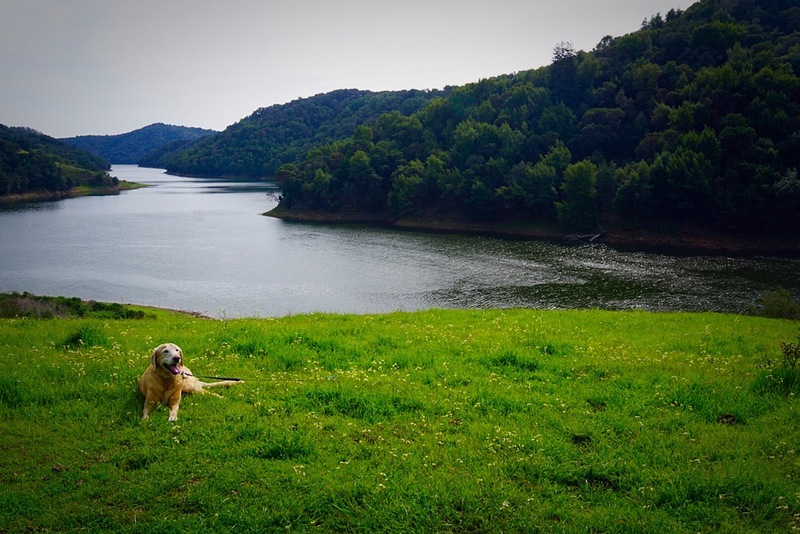 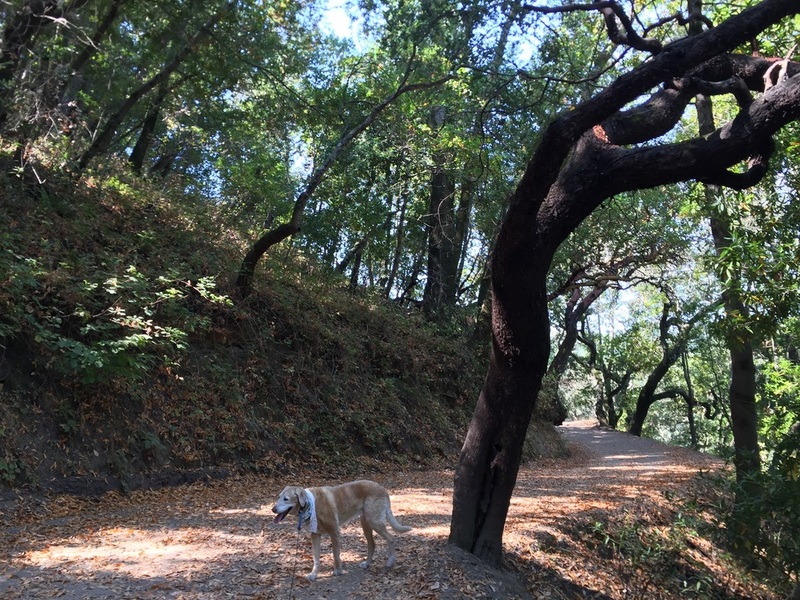 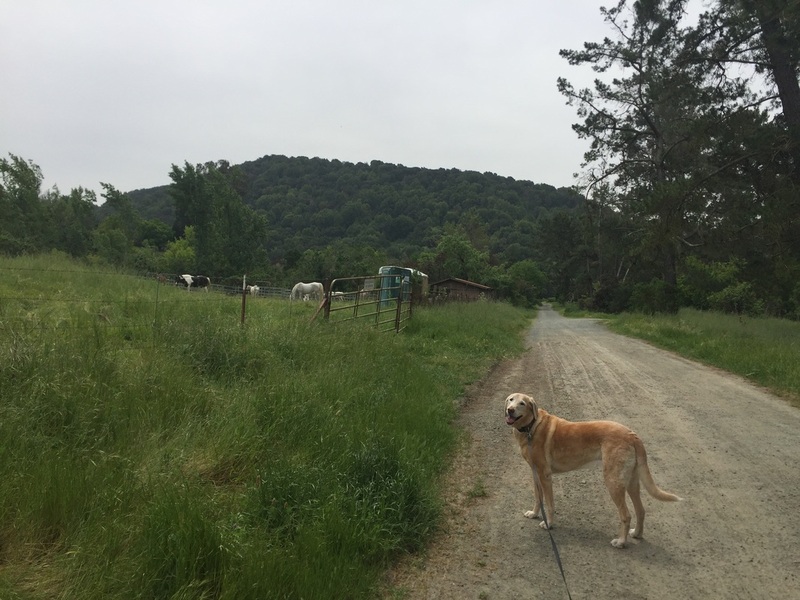 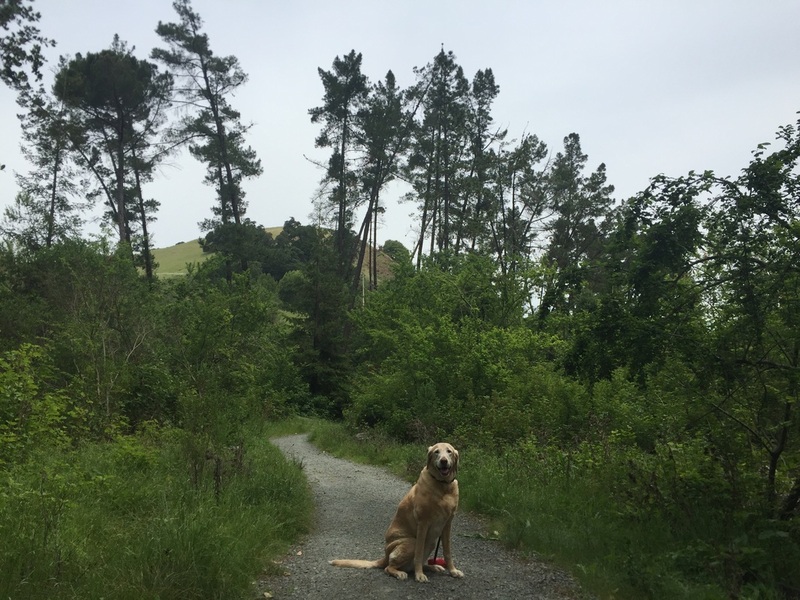 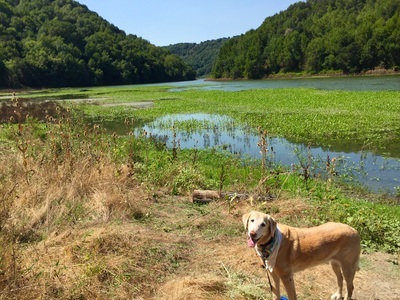 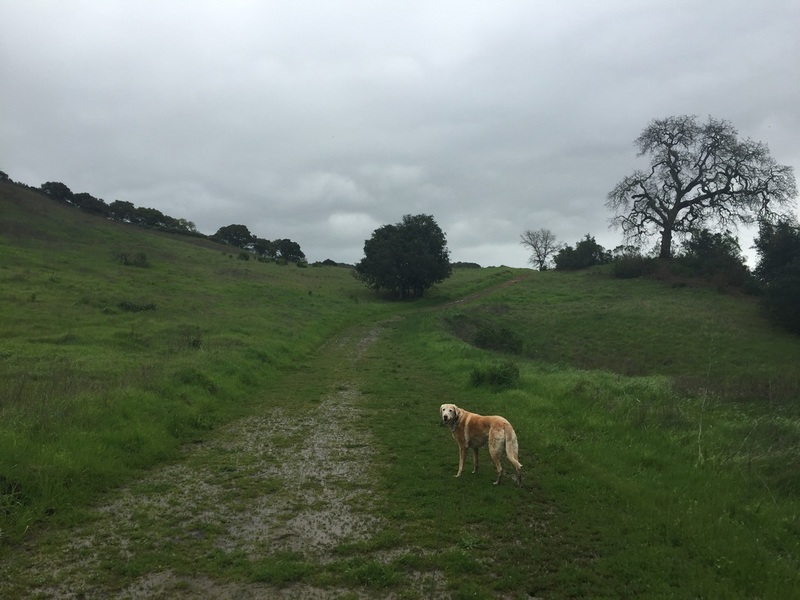 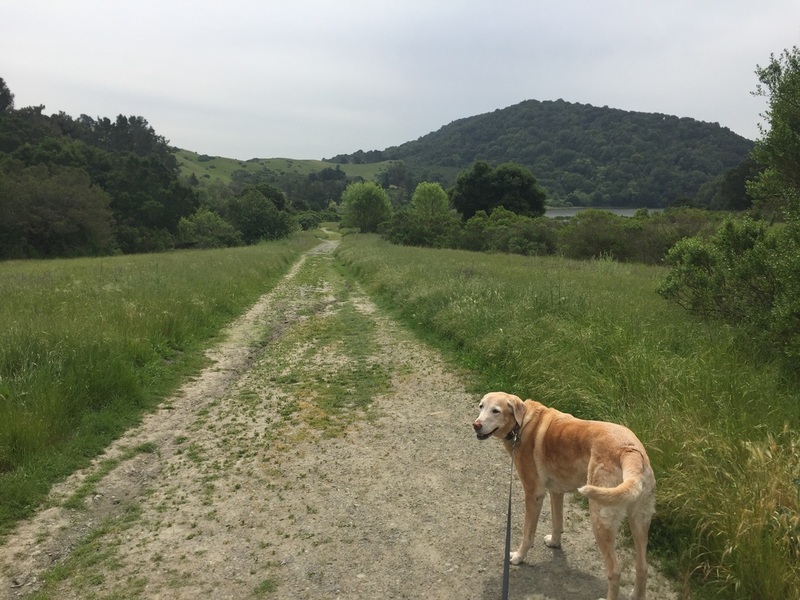 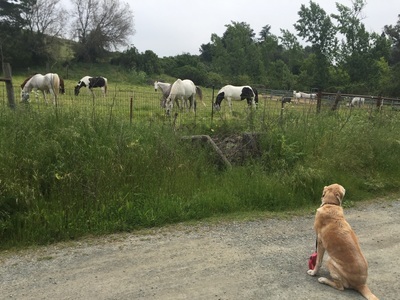 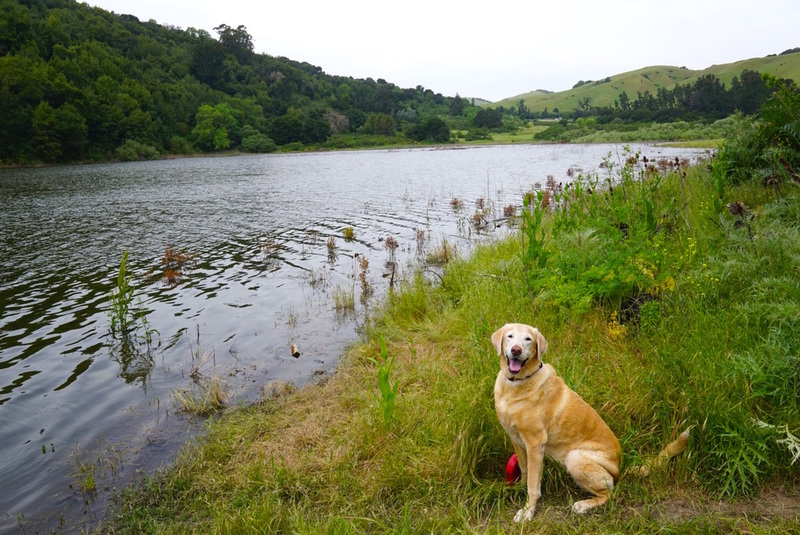 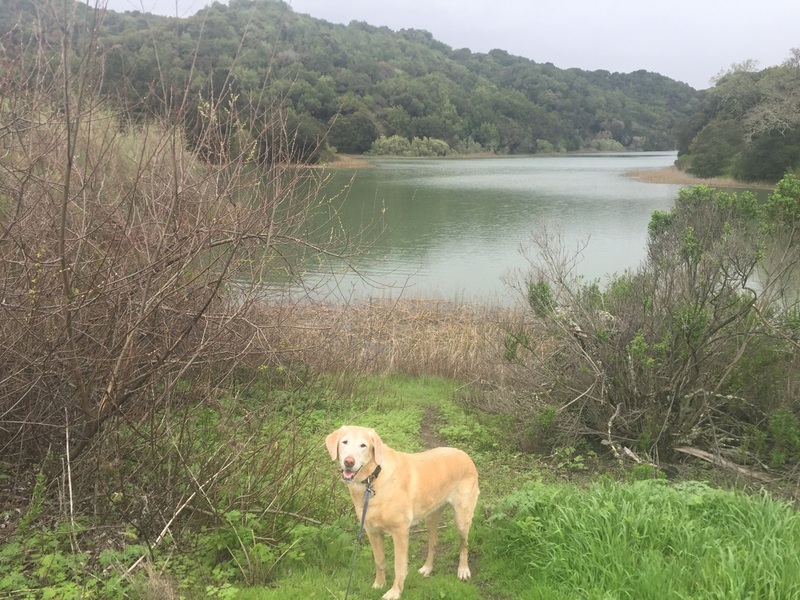 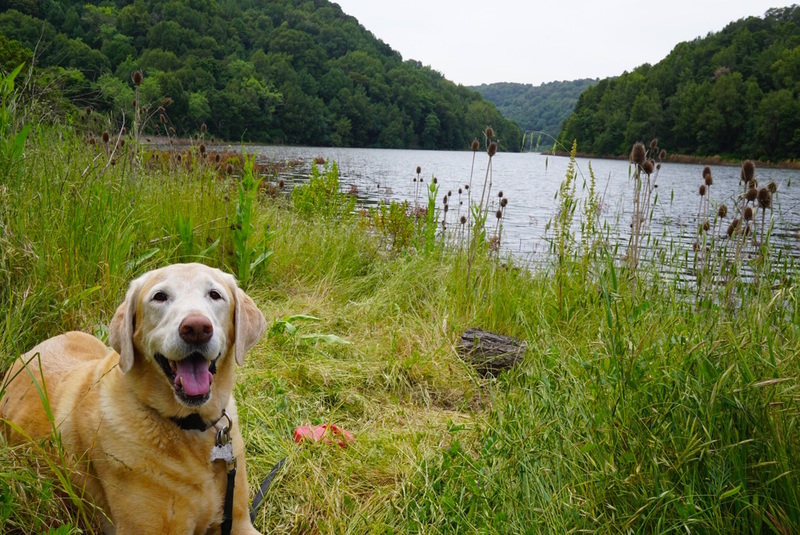 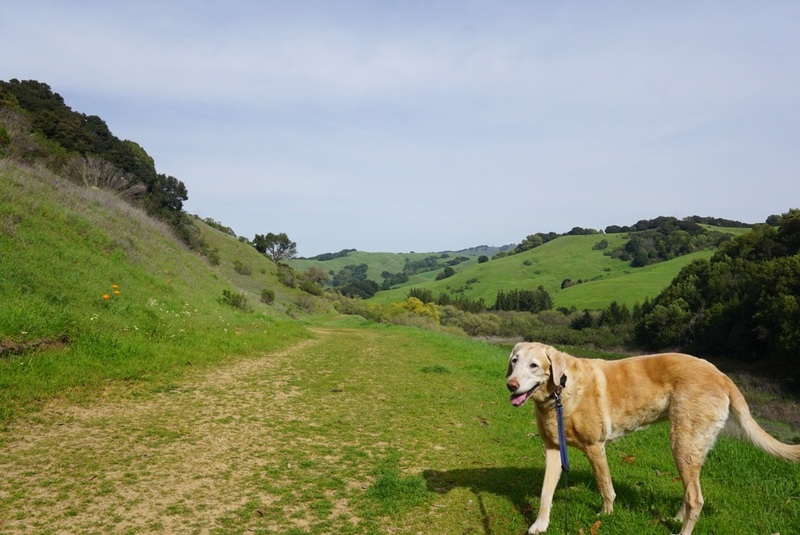 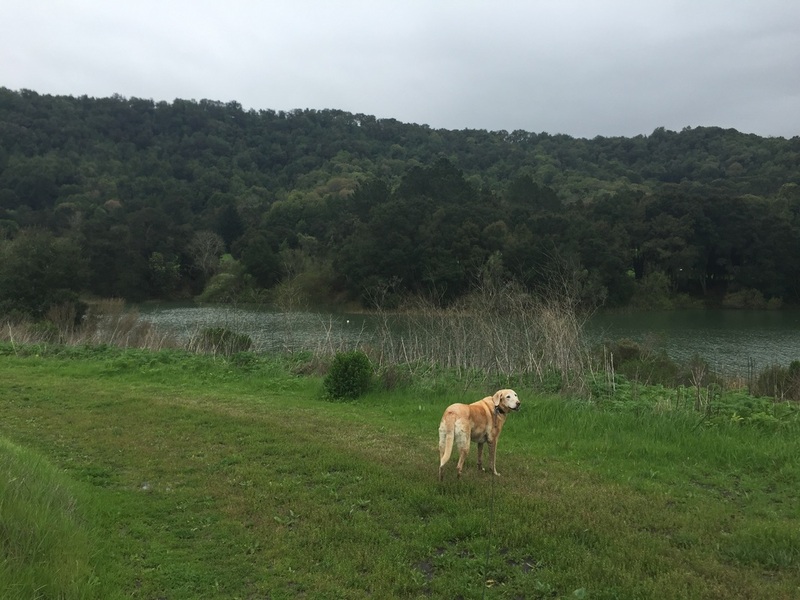 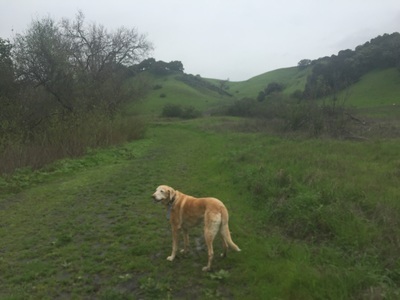 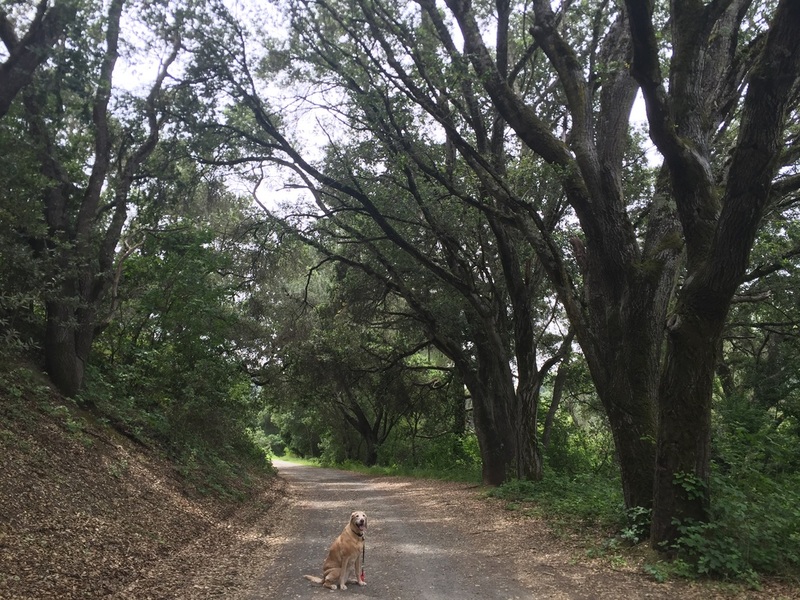 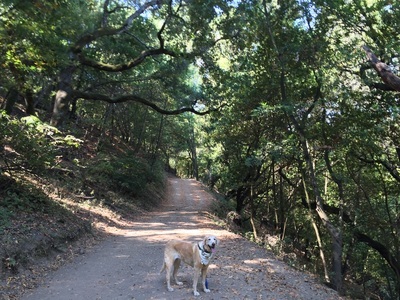 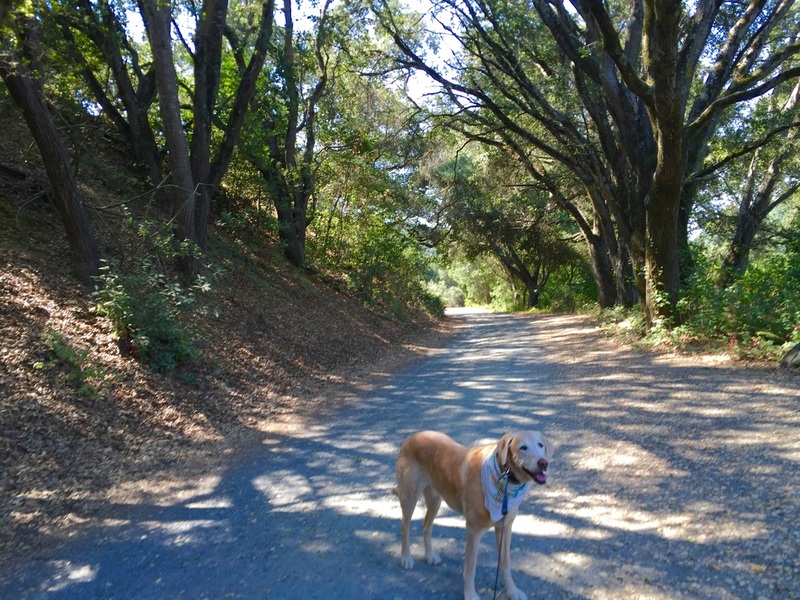 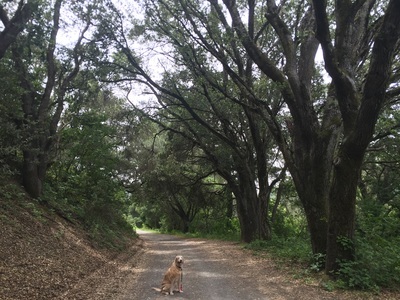 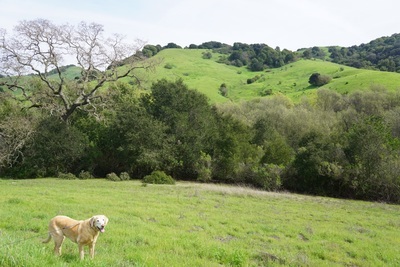 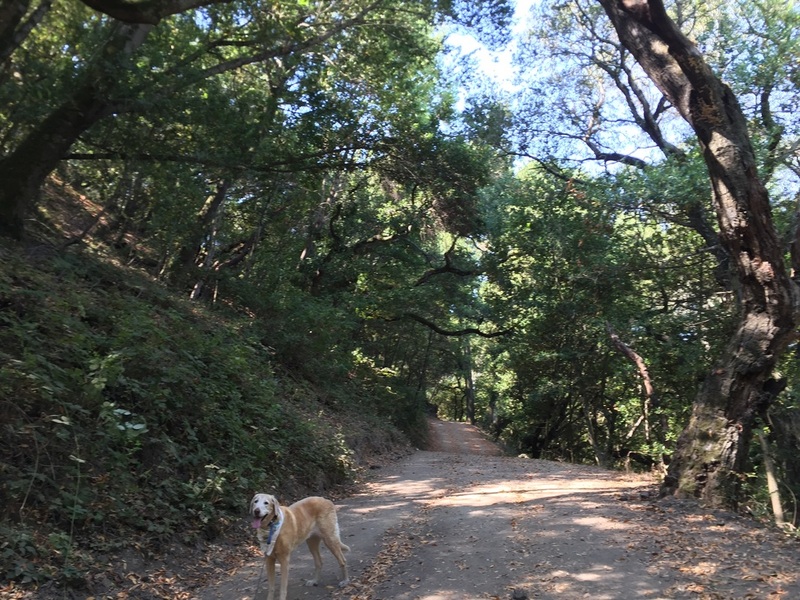 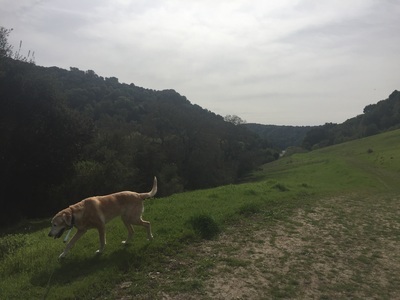 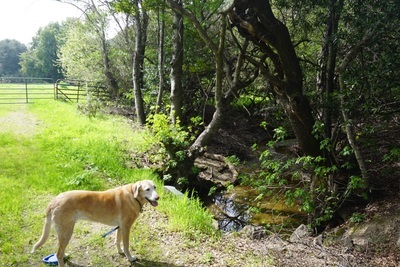 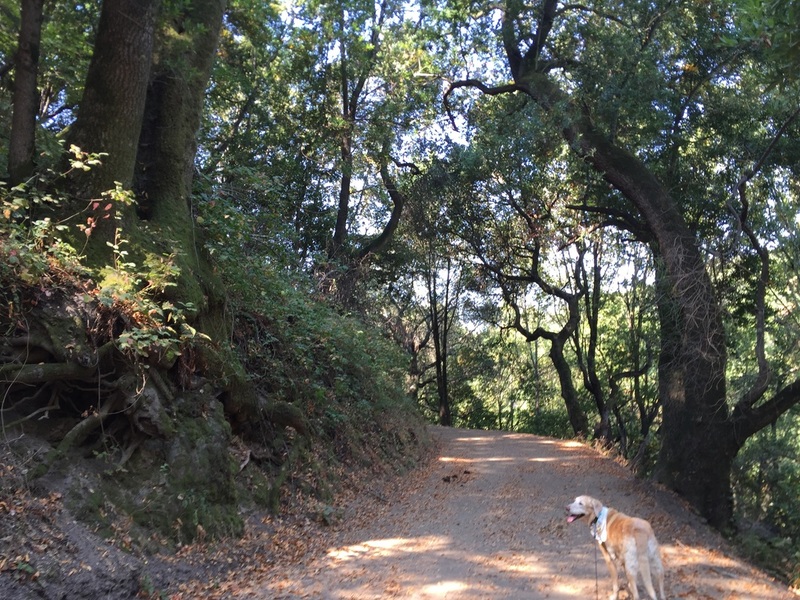 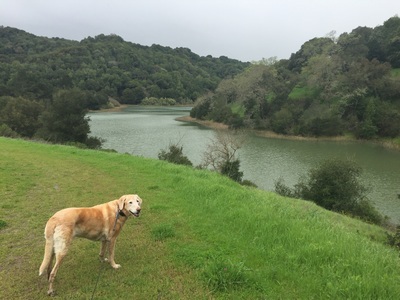 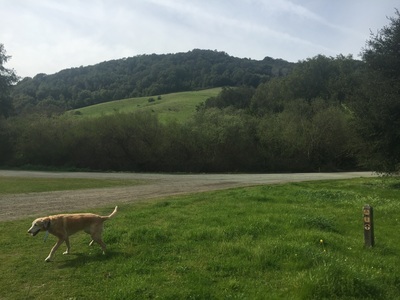 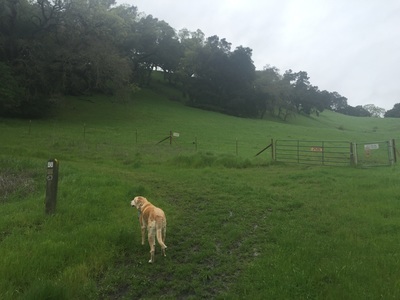 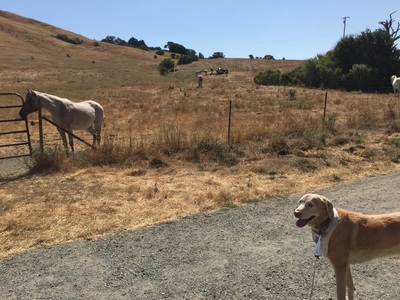 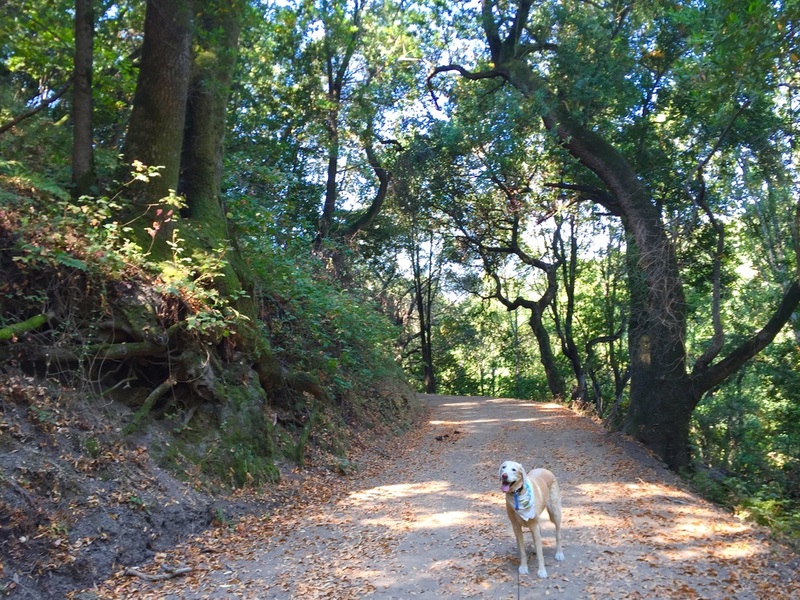 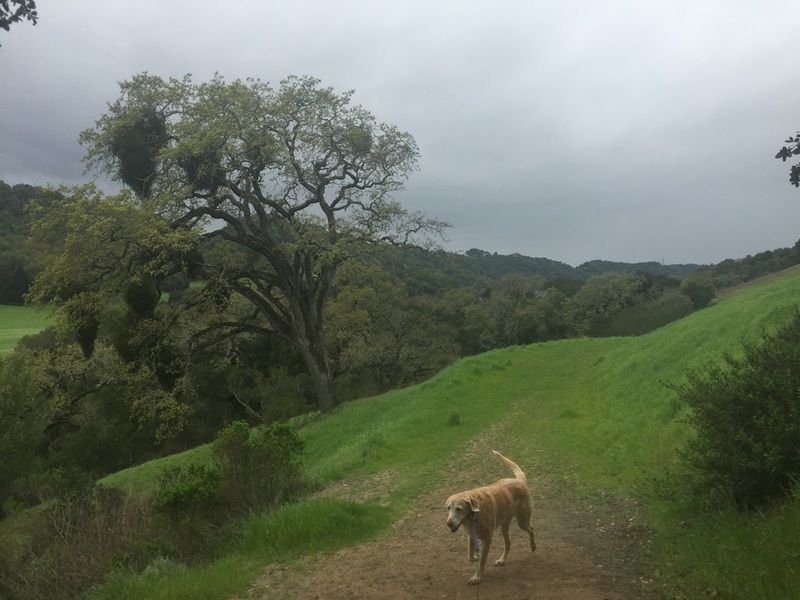 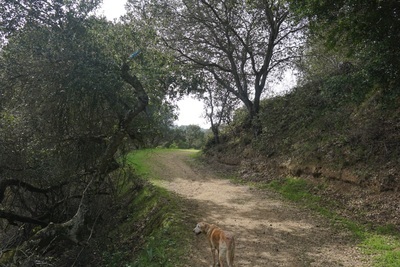 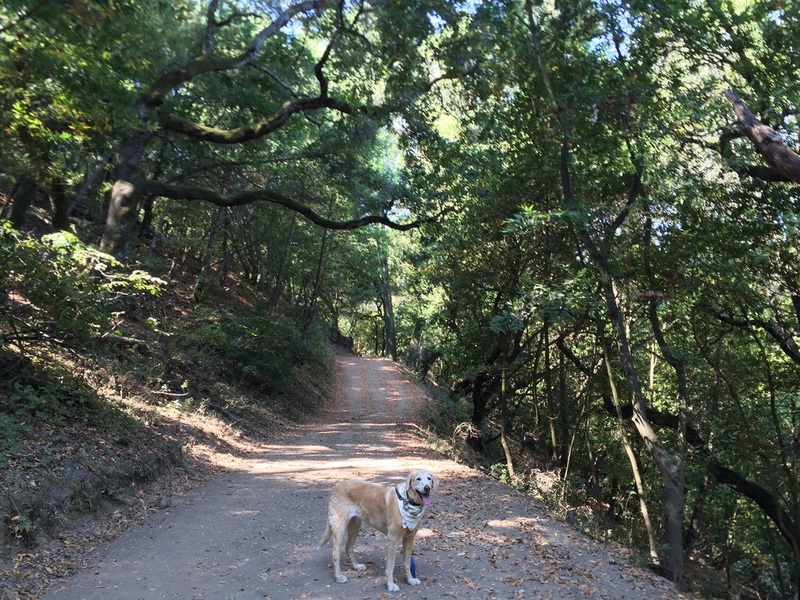 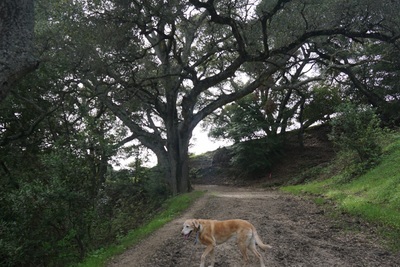 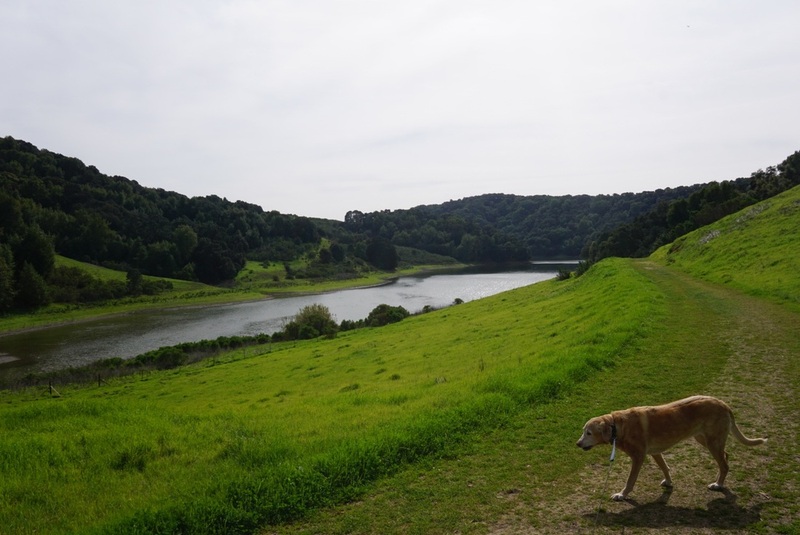 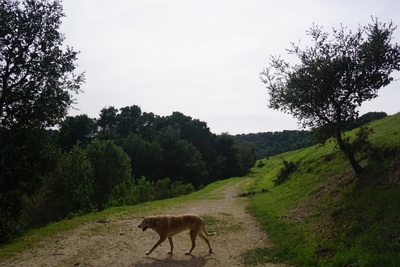 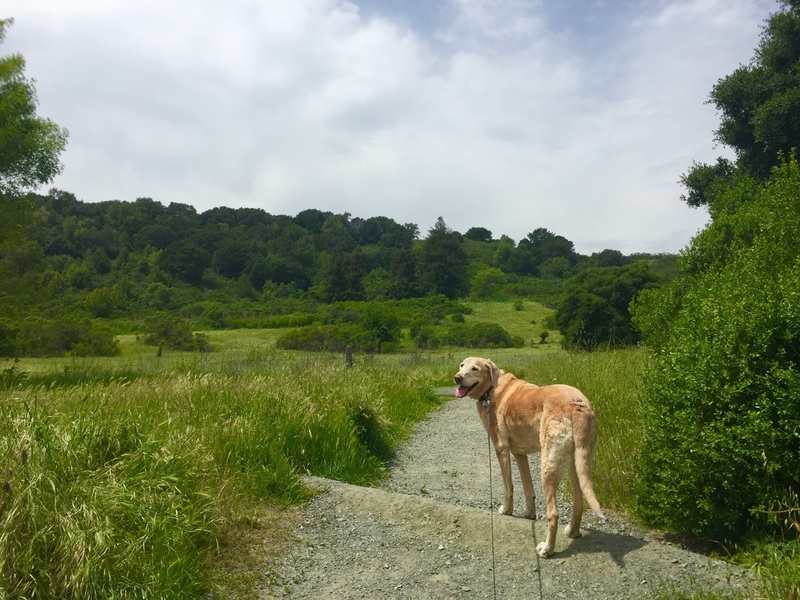 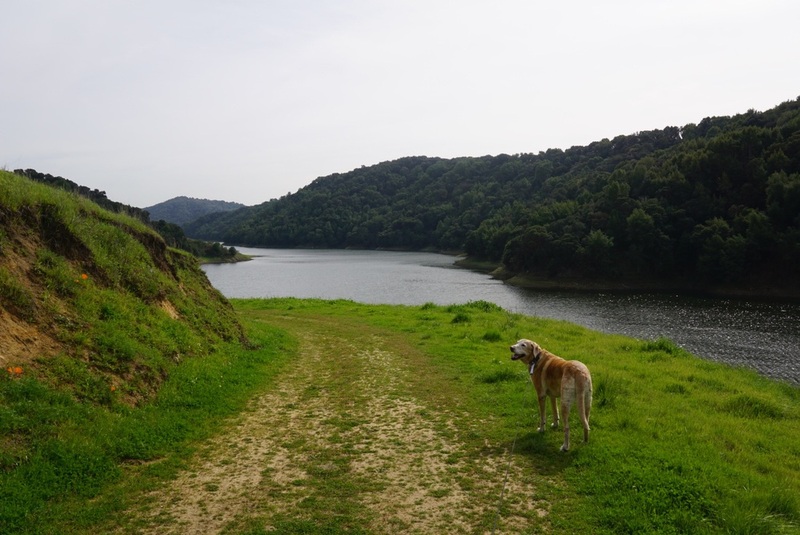 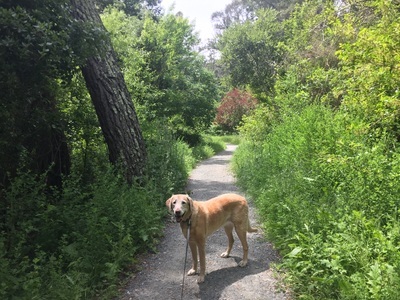 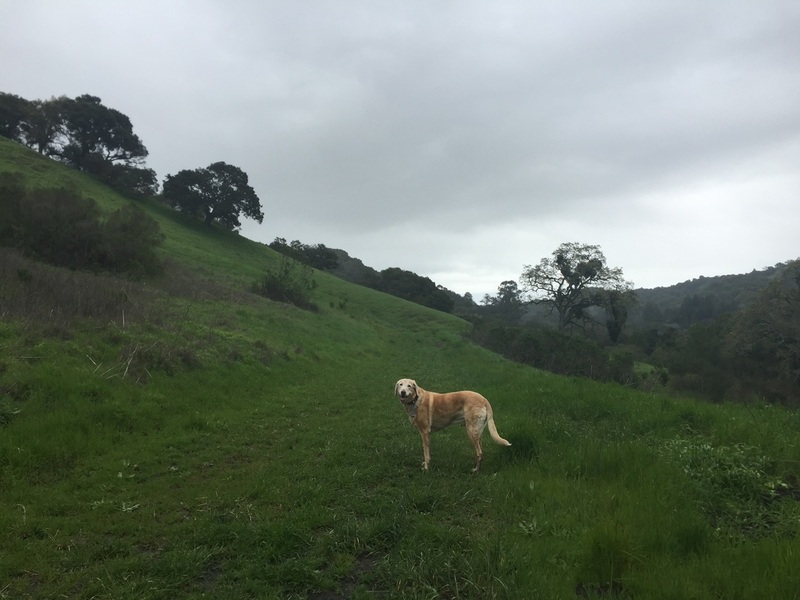 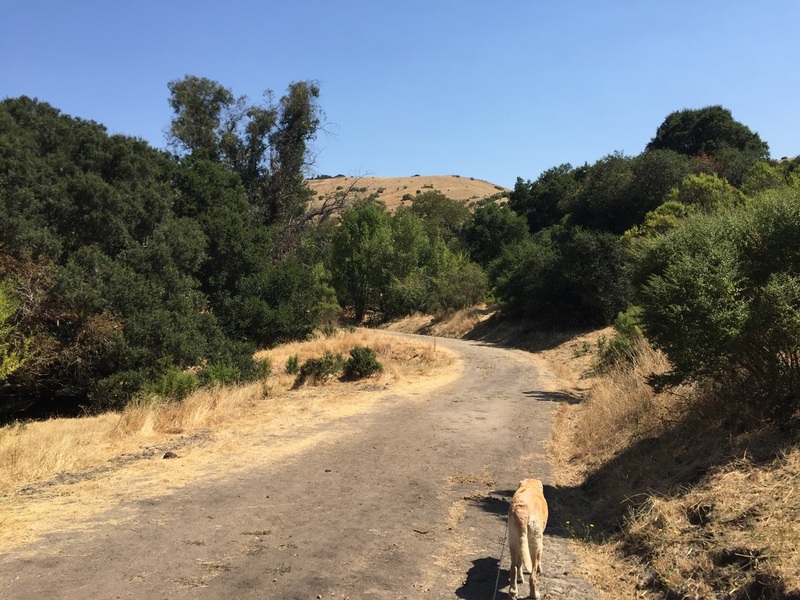 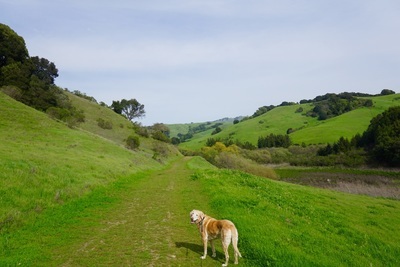 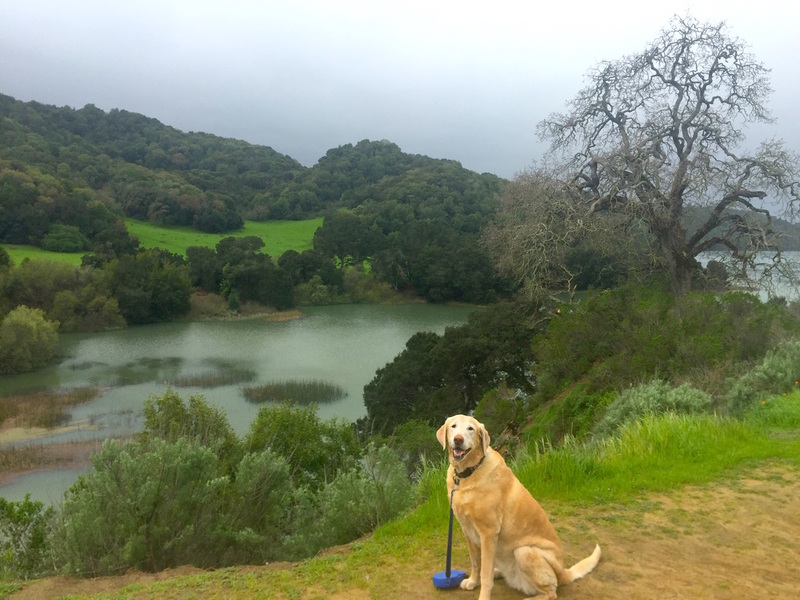 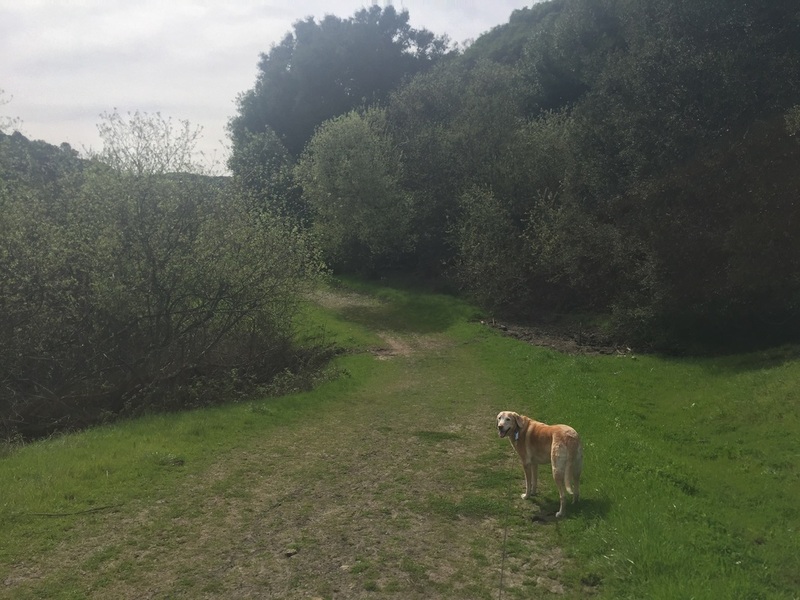 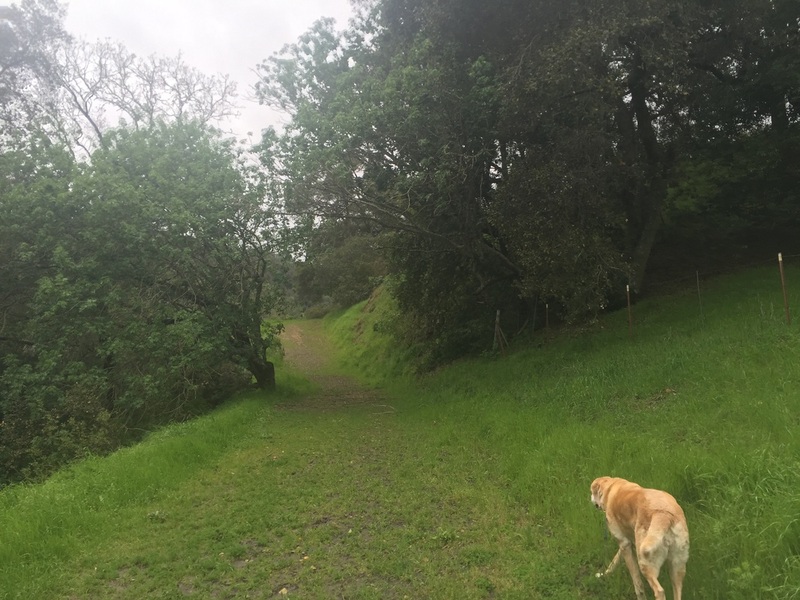 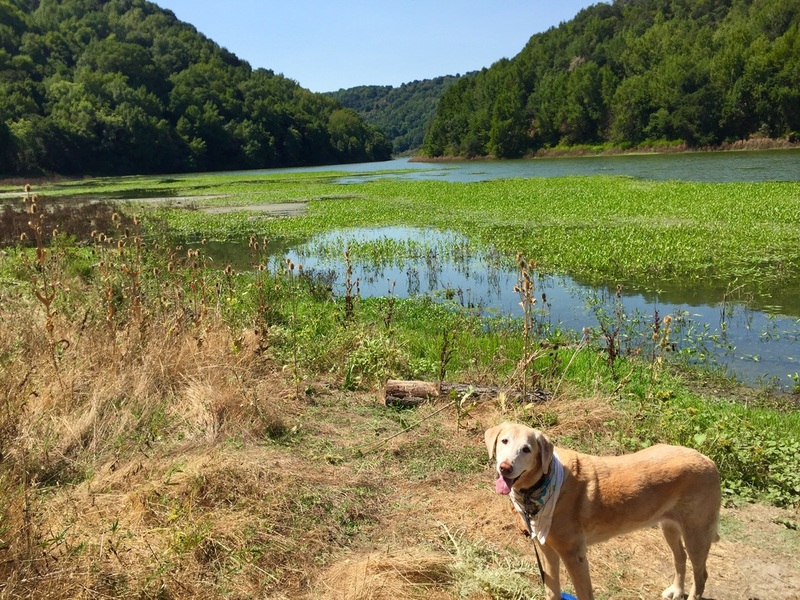 The EBMUD trails are a perfect backdrop to a revitalizing, yet peaceful hike that you and your dog will love. 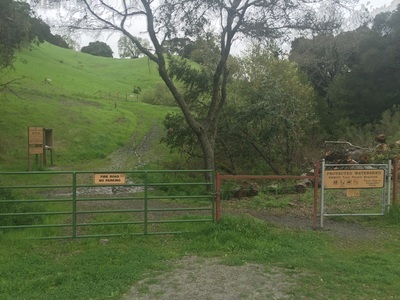 You will pass through several cattle gates but we did not see any cows or evidence of cows being currently in the area during our hike. Dogs are allowed on the 3.1 mile section of King’s Canyon Loop Trail, beginning at Rancho Laguna Park. 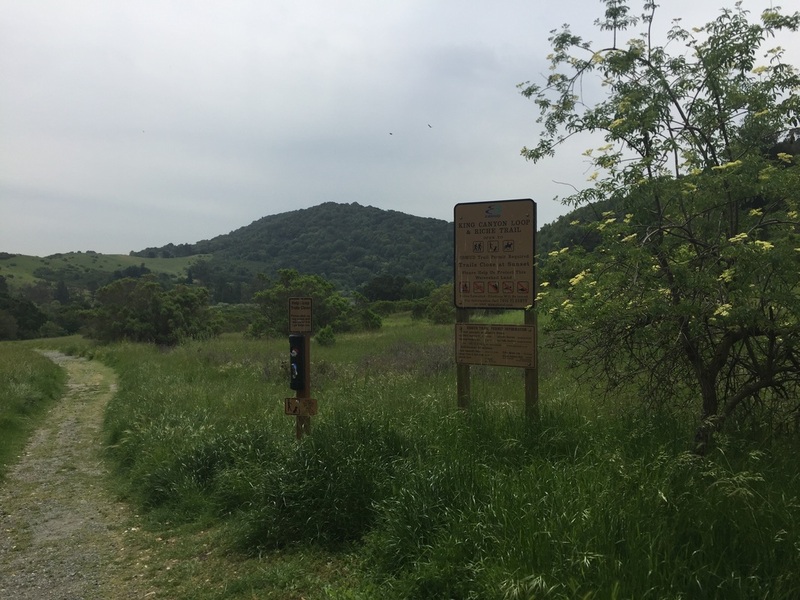 The hike starts off on a gravel trail but turns into a dirt and grass trail, passing through pine forests, fields of wildflowers and oak forests. 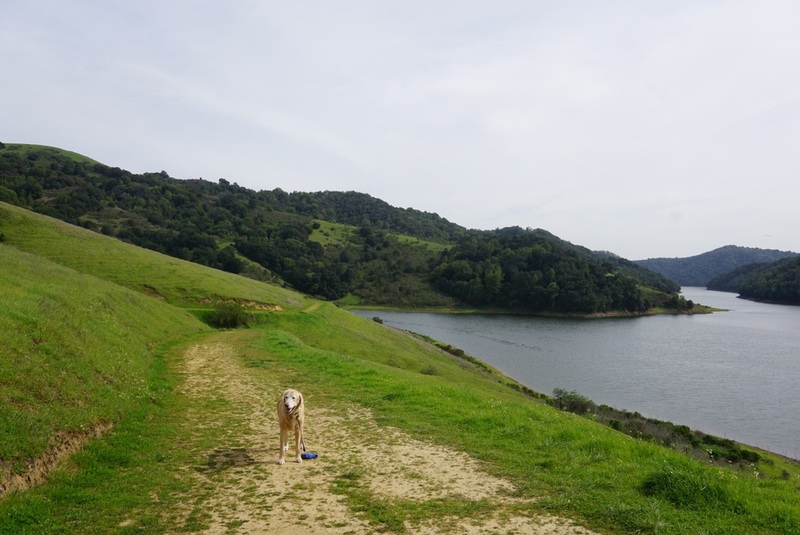 There are sweeping views of the San Leandro Reservoir during this hike. 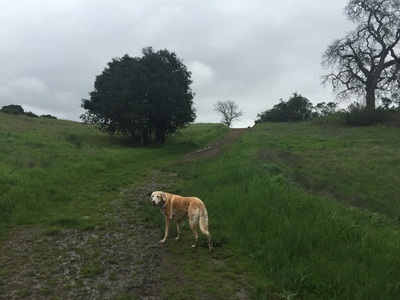 These trails can get very muddy after a good rain. You can also begin this hike in the Valle Vista Staging Area, and you'll hike on the 0.7 mile section of the Riche Trail, which is a flat, dirt road that circles near the staging area and has a view of the reservoir on one side. 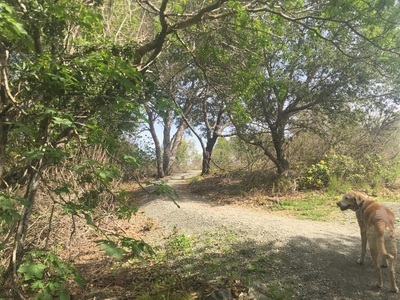 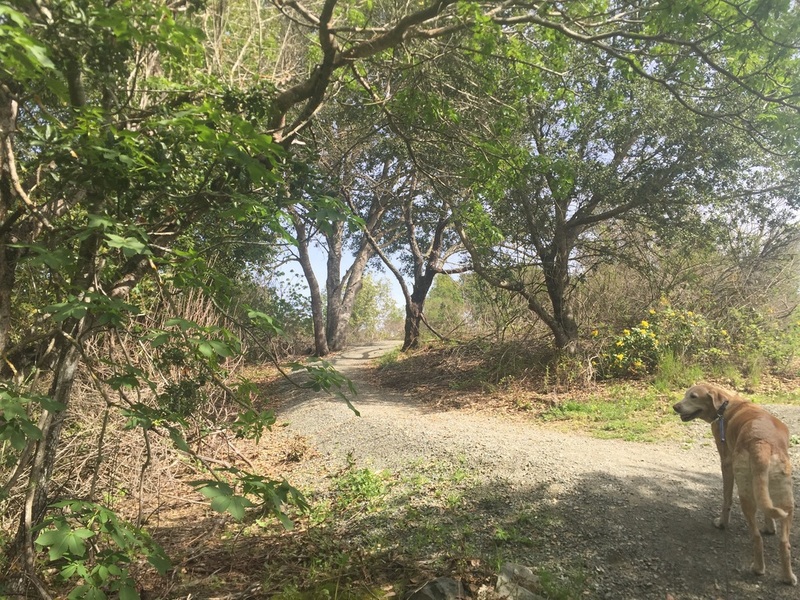 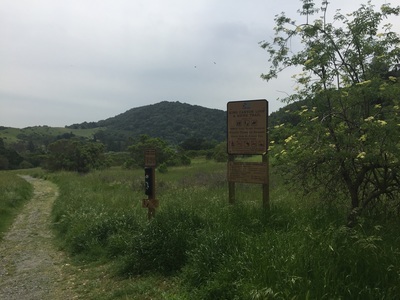 Another option is to start at the Hampton Staging area and take the Hampton Trail, a 0.6 mile trail that connects to Oursan Trail for 4 miles in one direction and 5.4 miles in the other direction. You can also start at the Bear Creek Staging Area. 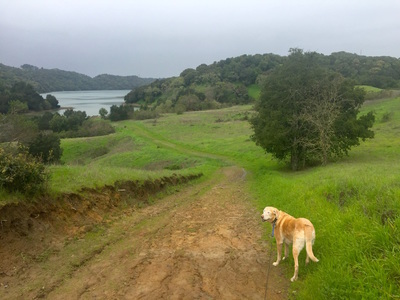 The trail heading towards the Bear Creek Staging Area skirts along Briones Reservoir, and there are great views of the water. See maps below for trails. 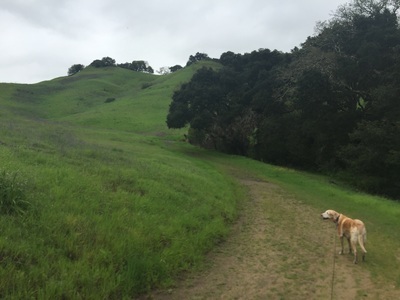 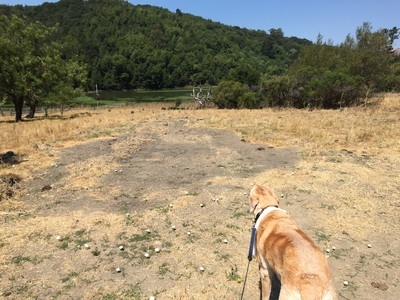 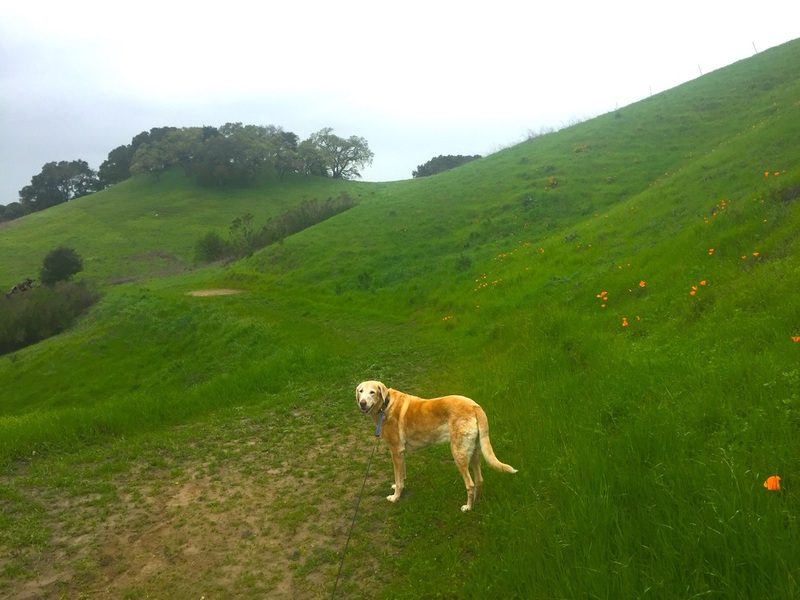 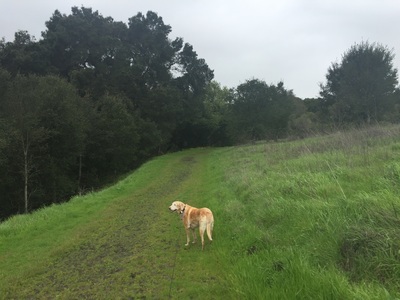 Note that the dog-friendly trails mentioned above are beige on the EBMUD maps below. 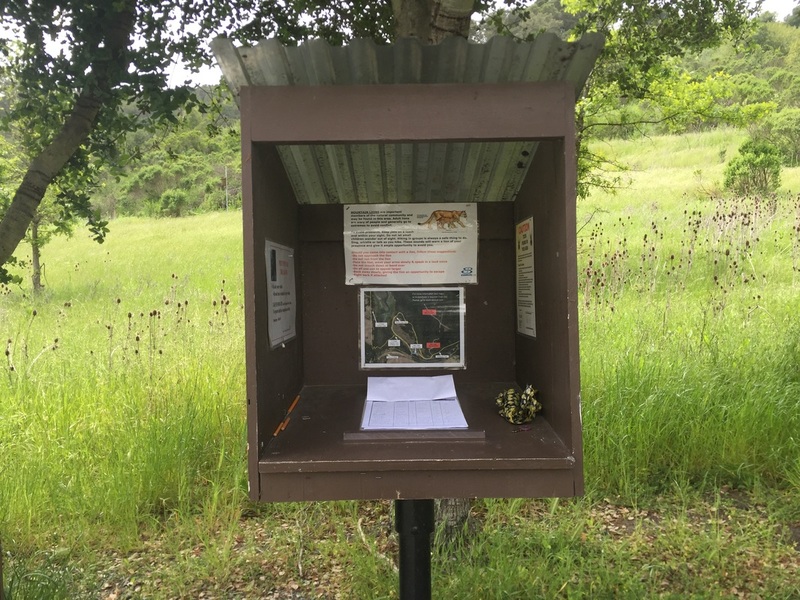 Hike directions from Rancho Laguna Park: During our first hike we started at Rancho Laguna Park. Park and walk towards the play structure and follow the path behind it. 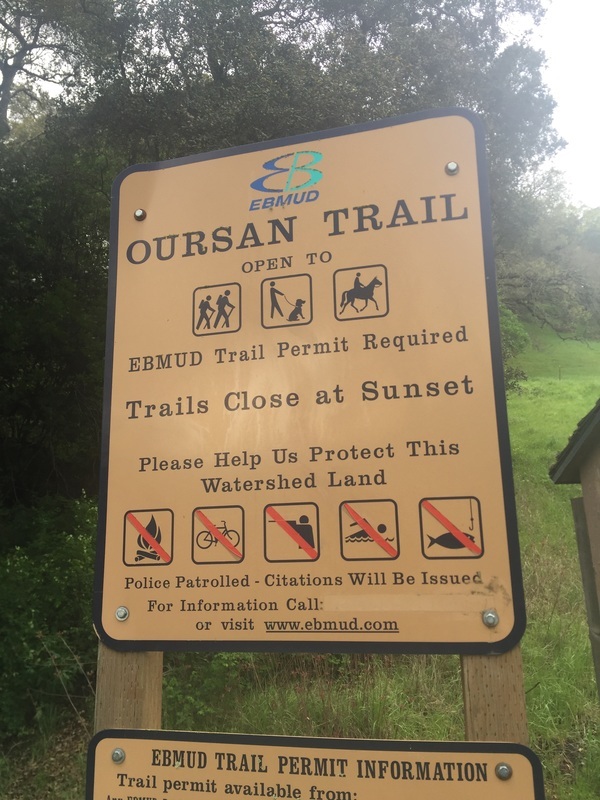 You will come to an EBMUD trail gate. Sign in and then head up the gravel trail, over the creek. 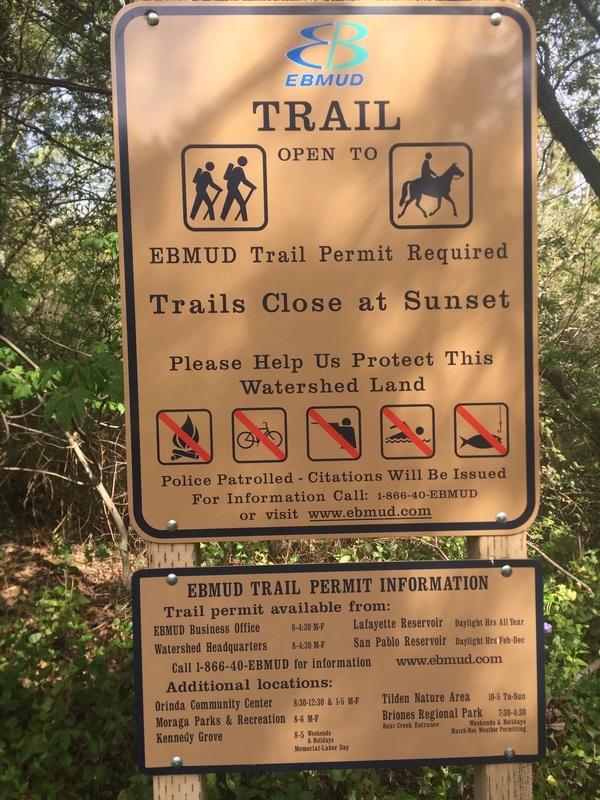 You will come to another EBMUD trail gate. 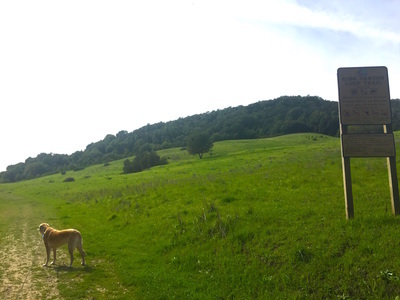 Hike through it and to your right. 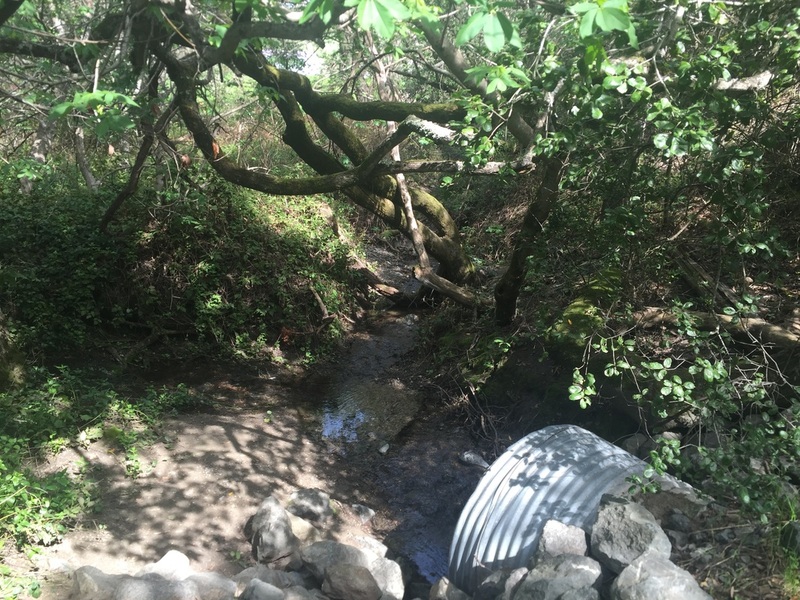 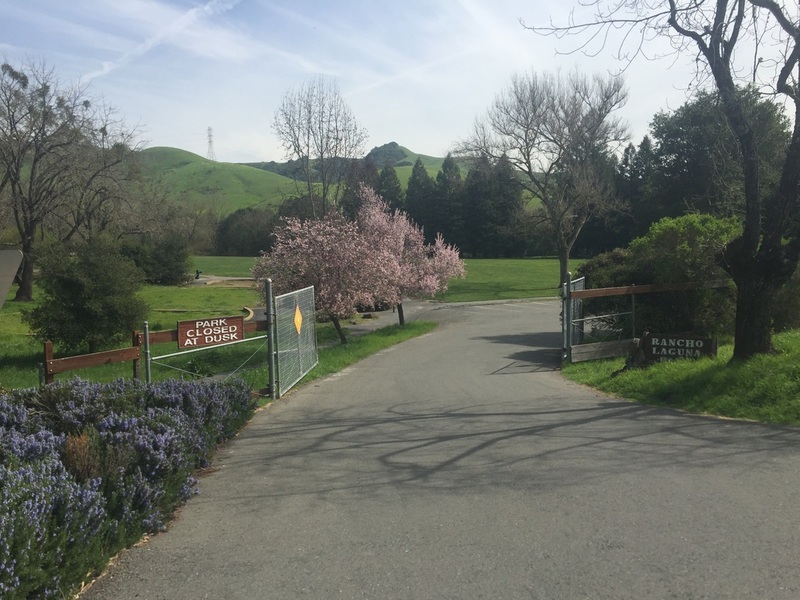 Hike around the bend and you will come to another EBMUD trail gate, walk through it. 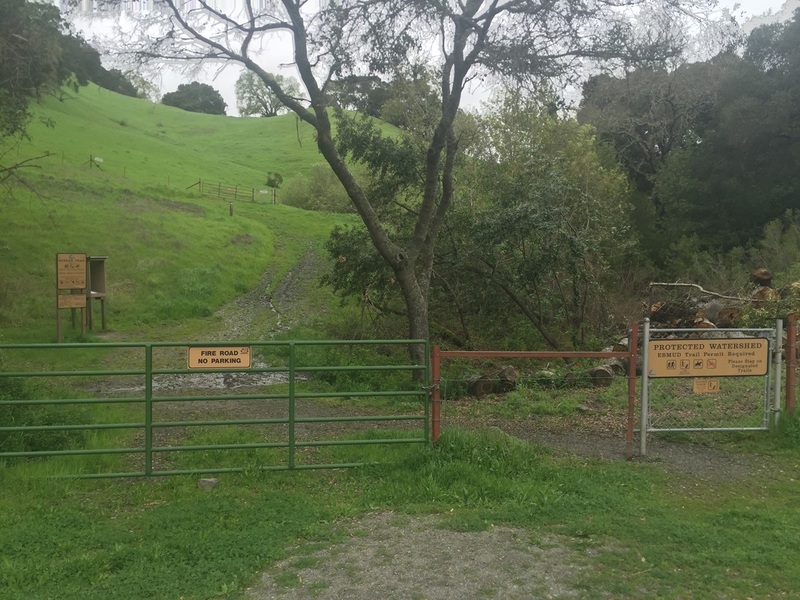 You will pass through a field and near the creek you will see another trail gate, walk through it. 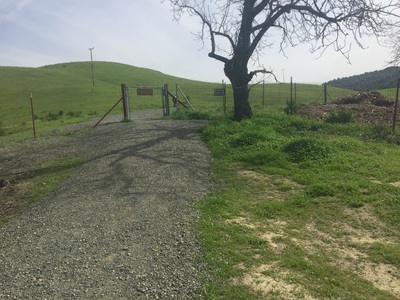 Head to your right (away from the cattle corral), down the paved road and you will soon see another trail gate to your left. 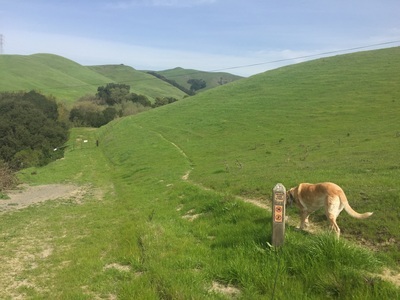 Pass through it and continue on the dog-friendly trail to your left. 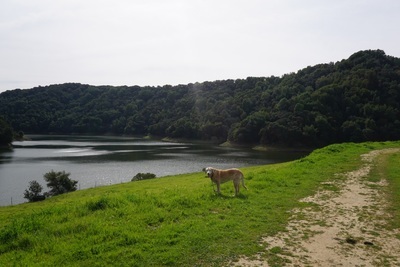 You can hike this trail for 3.1 miles and nearly all of it has views of the reservoir. 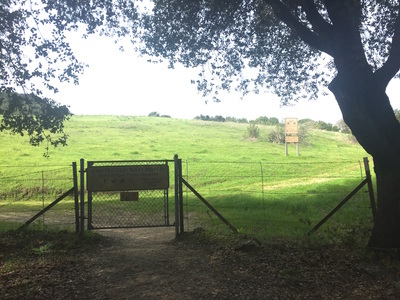 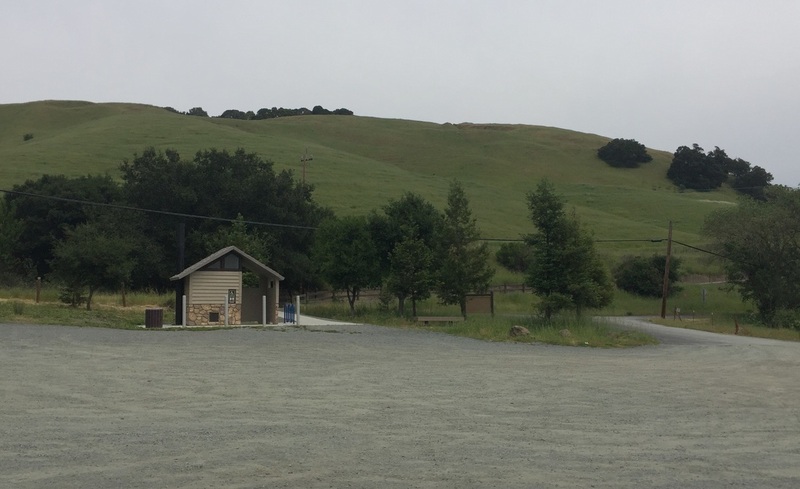 Hike directions from the Valle Vista Staging Area: From the parking lot, head through the EBMUD gate, sign in, and start your hike to your left. 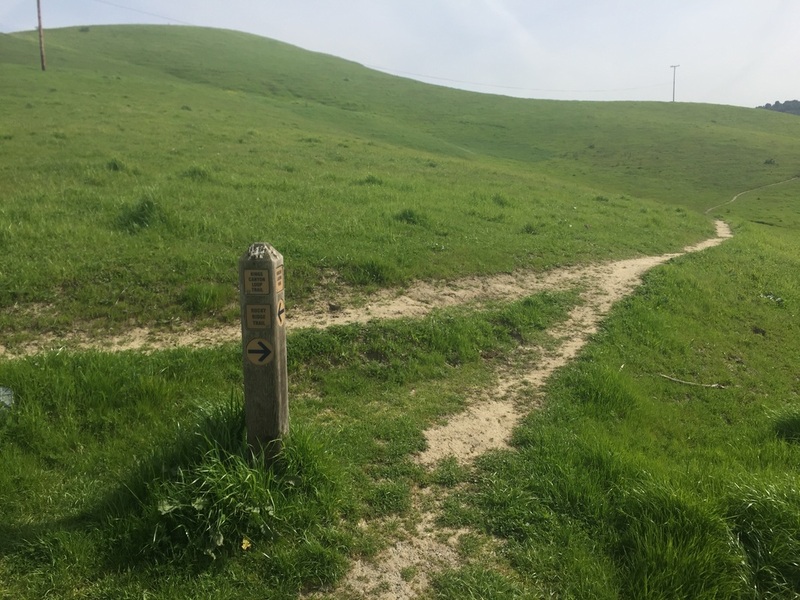 You will soon come to a split- take the trail to your left. 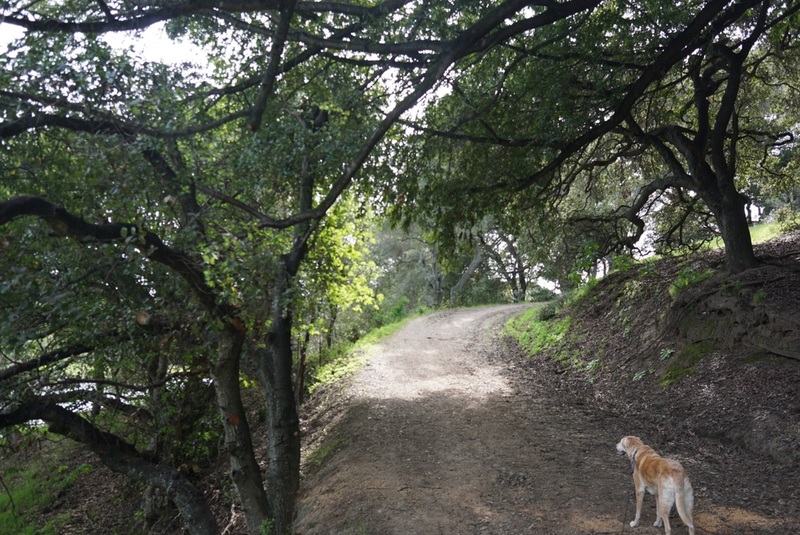 This will take you on part of the Riche Trail to the King's Canyon Loop trail. 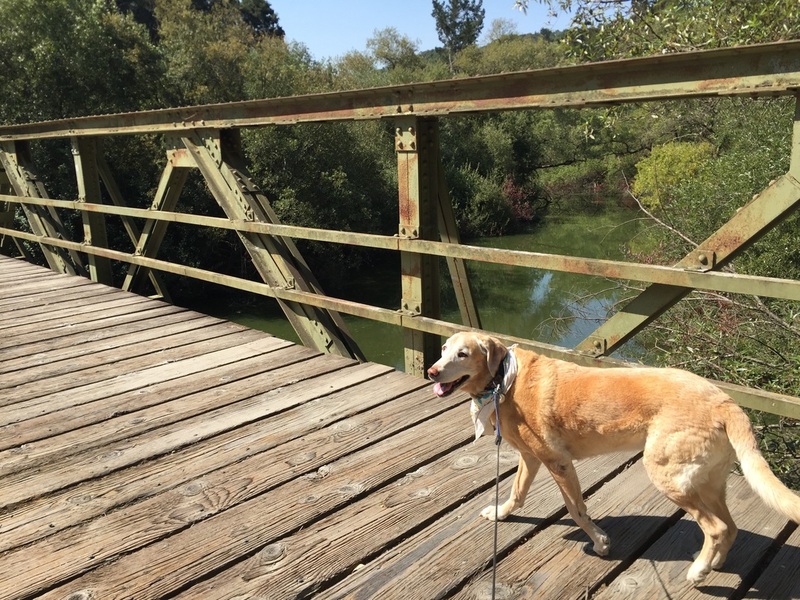 You will cross over a bridge, pass some horse stables, and you will even find a partially hidden bench next to the water on the right side. 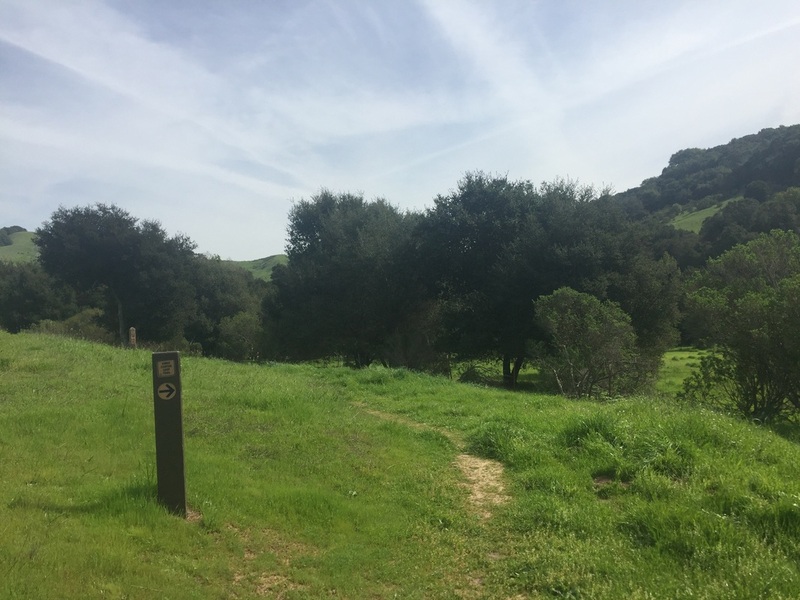 You can hike this trail all the way to the Rancho Laguna staging area, but then you will have to turn back. This entire dog-friendly section is 3.6 miles one-way or 7.2 miles there and back. 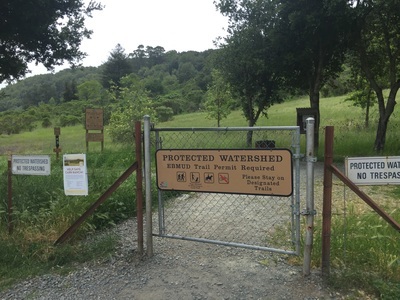 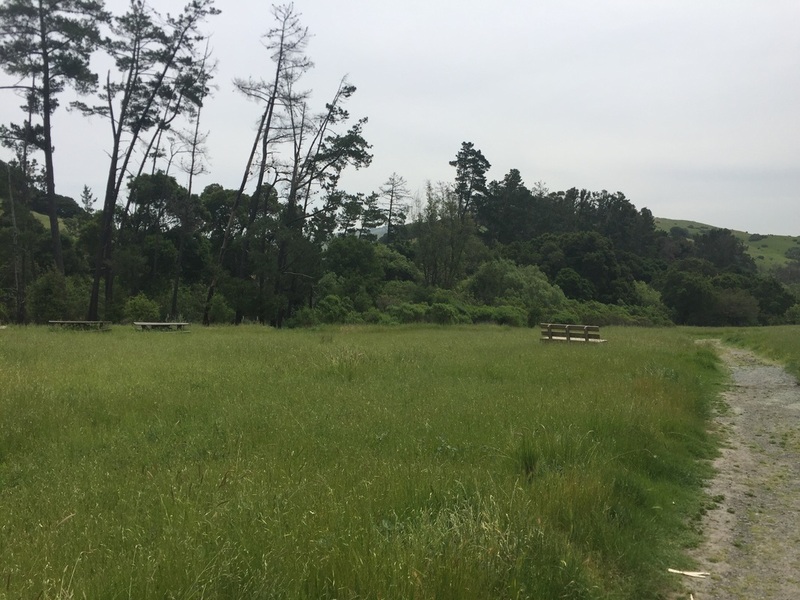 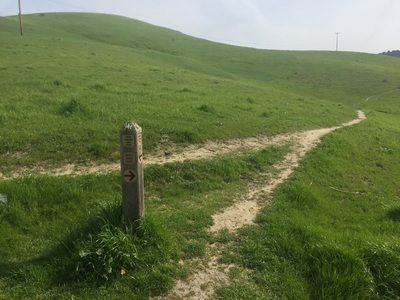 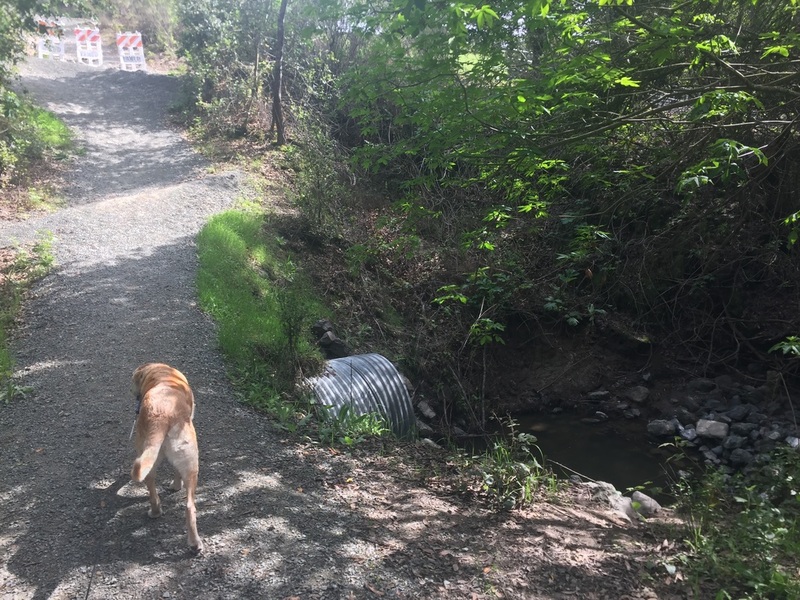 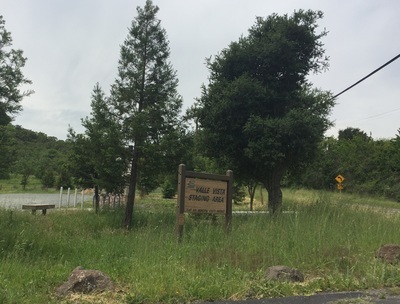 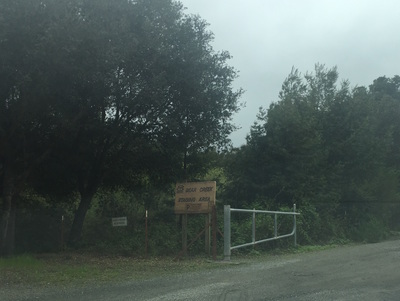 Hike directions from EBMUD Bear Creek Staging Area: From the dirt/gravel parking area, take the gate to the right marked "Oursan Trail," sign in and head uphill and to the left. This trail continues for 9.4 miles, skirting the edge of the reservoir for the first 5.4 miles. 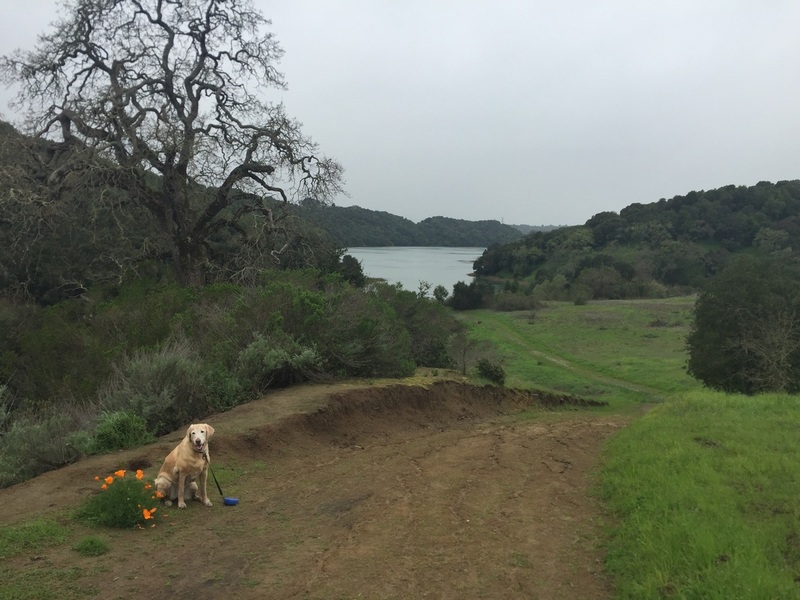 There are distant views of the reservoir for the last 4 miles, after you pass Hampton Trail. This trail can get very muddy after it rains. 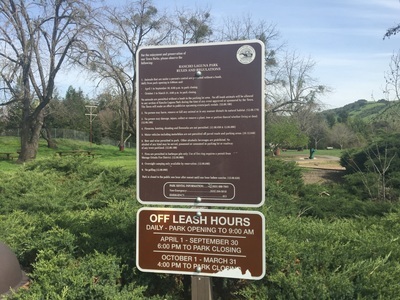 There’s an off-leash dog park at Rancho Laguna Park. Off-leash hours start at 4PM for Oct-Mar and 6PM for Apr-Sept. Flushing toilets, running water and water fountains are available at Rancho Laguna Park. 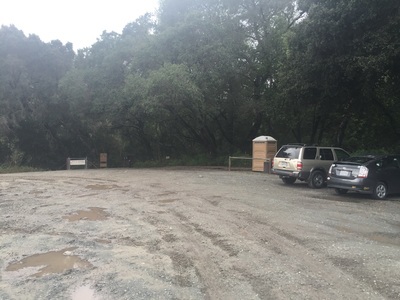 A pit toilet is available at the Valle Vista Staging Area, along with 1 trash can and another near the bridge. 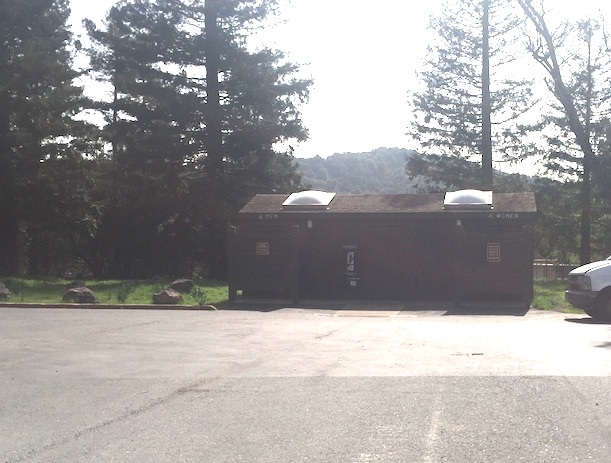 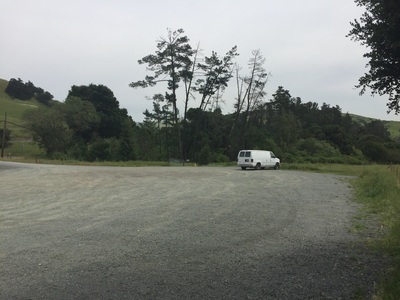 A porta-potty and trash can are available at the EBMUD Bear Creek Staging Area.